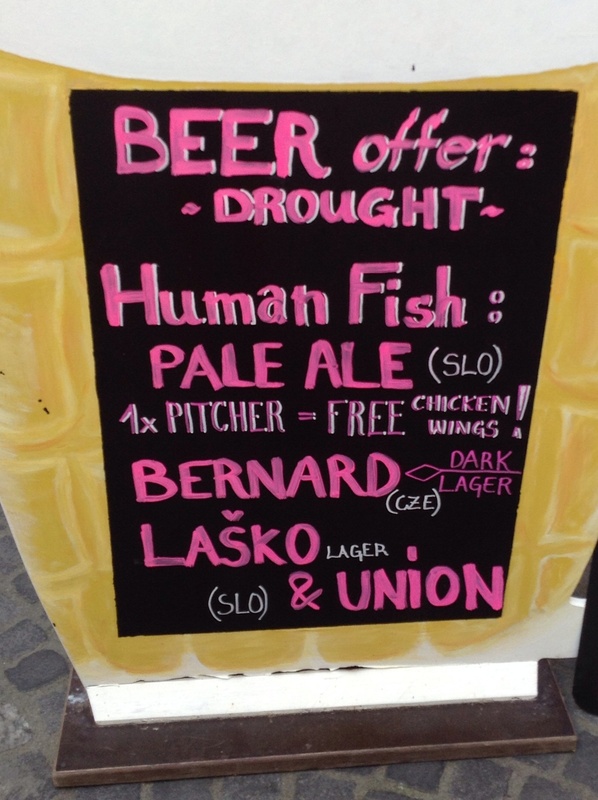 In another example of how things get a little lost in translation how about the top billing on this board standing outside a little bar in Stari Trg – one of the many quaint backstreets of Ljubljana (which I will call Ljub) whence this latest blog comes. It is a bar, let’s not forget! Maybe it needs to reconsider its offer. As for the Human Fish – well, let’s not even go there. There is a Dragon Bridge in Ljub but mermaids too? I don’t think so! The 11.18 from Lesce Bled got us into Slovenia’s lovely capital in less than an hour. Happily it was a short stagger from the station to the H2O hostel as today, in 38 degrees, the rucksack feels very heavy indeed! Ljub is one of the most picturesque cities I’ve visited, a truly sparkly little gem with surprises around every corner. The old part is reminiscent of Salzburg – the river, the castle high up on the hill, lots of churches and pale painted buildings. But Ljub feels more relaxed, more lived in and much, much more cool, man. The Slovenian 2CV club was in town for a little vroom vrooming and showing off, the way 2CVs do! We heard them before we saw them, about 15 of them honking their horns at one another as they gathered for a sort of 2CV conga through the streets. In various states of wellbeing, some were absolute beauties on which many hours of elbow grease and T-cut had been passed and many euros spent. It’s late but the night is but a youth for the throngs of young people hitting the bars and clubs for which the city is famous. We were tempted but….. Instead we’re hitting the hay. a lovely letter from Andy today in response to mine about John. He’ll be pleased. Take care you two Happy Wanderers! !